Reach out to us for all your business's data wiring and fiber optics needs. The professionals at Custom Electrical Solutions of Tamarac, FL are your local experts in data wiring and fiber optics. We work with residential and commercial customers to provide installations and upgrades on all current data systems. 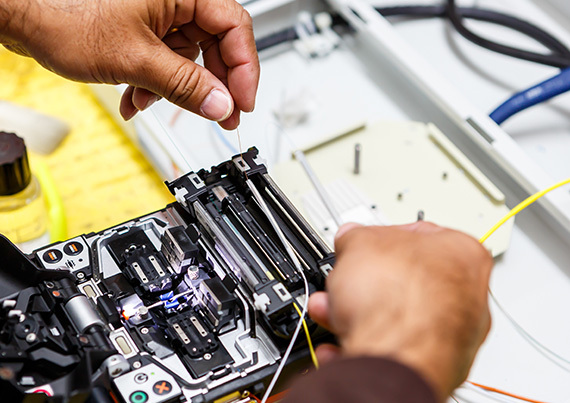 Our specialists provide structured data and voice cabling for every need. Ongoing system maintenance is also available to keep you up and running reliably. Best of all, our services are always on-time and on-budget. We work with you one-on-one to provide the solutions you need at prices you cannot beat. Check out our Google Reviews to see why we are rated a 5-Star company! Custom Electrical Solutions is your single-source contractor for all your communications needs. We are easy to work with and will craft solutions to fit your budget and your schedule, minimizing cost and down-time. If you have questions about getting started or would like a free, no-obligation estimate, please reach out to us any time. We look forward to working with you soon!